ORLANDO, Fla. (March 16, 2017) - Universal Orlando Youth Programs has launched the all-new Your Classroom in Motion: A STEAM App Series. This inventive collection of educational programs uses the thrills of world-renowned theme park attractions to shape powerful and experiential learning experiences focused on Science, Technology, Engineering, the Arts and Mathematics. Using a tablet with software exclusive to groups participating in the program at Universal Orlando, students will experience hands-on learning lessons at top attractions within Universal Studios Florida and Universal's Islands of Adventure. They'll have the ability to make scientific observations, calculate speeds and vectors, and even build an entire ride motion profile. Transformers ROLL Out - Students learn about the engineering principles of the 6 Degrees of Freedom and analyze TRANSFORMERS: The Ride-3D to reconstruct the ride vehicle's motion sequences. Hollywood Rip Ride Rockit Science - Students work in small groups to collect data and measure speed at different points along the Hollywood Rip Ride Rockit roller coaster to visually prove the law of conservation of energy. Kongtrol Panel - Using engineering principles, students will determine vectors and estimate distances to maneuver the ride vehicles around Skull Island: Reign of Kong. Mummy Dig-Site Detective - Focuses on scientific observation of Egyptian artistic elements and historical touches to investigate curious discoveries at the dig site beneath the Revenge of the Mummy attraction. Jurassic Paleobotany - Explore Jurassic Park for foliage from the era of the dinosaurs using a digital map to collect photographic samples of Jurassic-era plants. 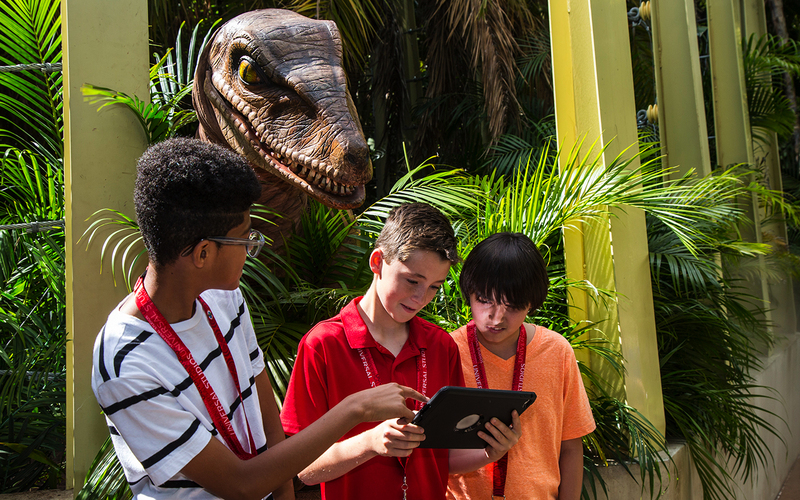 "Our goal is to transform classroom studies into compelling learning experiences at Universal Orlando that students genuinely enjoy," said Teresa Crews, Universal Orlando's educational program developer and a former classroom teacher. "The activities in these programs were designed to expose students to educational materials that will ignite a passion for learning and show them that classroom lessons can be applied to future career paths." To learn more about Universal Orlando Youth Programs and how your school can participate, visit www.UniversalOrlandoYouth.com or call 1-800-YOUTH15. About Universal Orlando Resort For more than 25 years, Universal Orlando Resort has been creating epic vacations for the entire family - incredible experiences that place guests in the heart of powerful stories and adventures. Universal Orlando's theme parks, Universal Studios Florida and Universal's Islands of Adventure, are home to some of the world's most exciting and innovative theme park experiences - including The Wizarding World of Harry Potter-Hogsmeade and The Wizarding World of Harry Potter-Diagon Alley. And on May 25, 2017, Universal Orlando will open its third park, Universal's Volcano Bay - an entirely new water theme park experience. Universal's on-site resort hotels, Loews Portofino Bay Hotel, the Hard Rock Hotel, Loews Royal Pacific Resort, Universal's Cabana Bay Beach Resort and the all-new Loews Sapphire Falls Resort, are destinations unto themselves, allowing student groups to stay in the heart of the excitement. Its entertainment complex, Universal CityWalk, offers dining and entertainment for every member of the family.